When Bill McNamee, a professional truck driver for Carbon Express, first learned he’d be sleeping in hotel rooms while out on the road rather than in a sleeper berth, he thought the concept was strange. Five years later, he says he hopes to never spend another night in a sleeper. 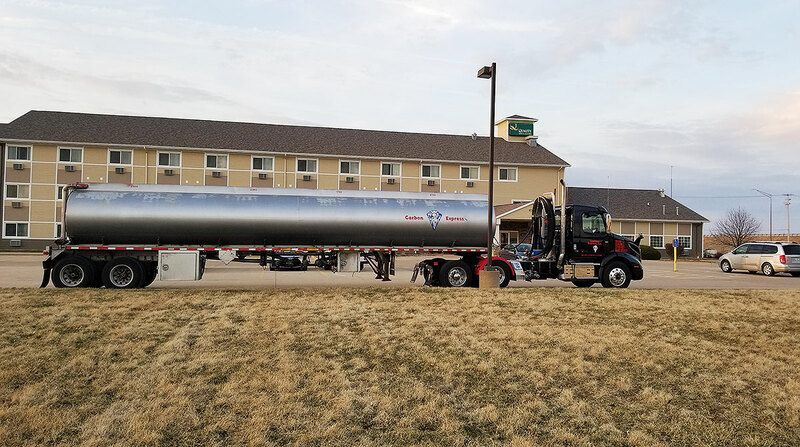 “After 20-plus years of being in the truck stop, this was foreign to me, but then you realize you can turn off the work switch, relax and shower at the end of the day,” McNamee said. Steve Rush, owner of the Wharton, N.J.-based carrier, said he converted all of his company-owned tractors to daycabs in 2010 and made the switch to hotel lodging, calling it one of the best decisions he has made. “The benefits speak for themselves: better sleep, no parking problems and drivers are treated as all other mainstream people at work are, rather than being pushed aside,” he said. Carbon Express is one of several carriers that told Transport Topics they are embracing daycabs and paid lodging, which Rush said improves safety because drivers are better rested. “Sleeping in the back of the truck is like you working at your desk all day long then pulling out a portable bed and going to sleep,” he said. Moreover, Rush said his 75-truck fleet has seen an increase in productivity, in large part because his daycabs can haul 11-21% more product than his competitors due to the weight savings compared with a sleeper tractor. “The improvement in efficiency is there and always has been, but it has been ignored by this industry in favor of keeping the driver in the sleeper,” Rush said. That increase in productivity, along with lower equipment costs, helps Rush offset the added expense of the hotel bill, which averages in the mid-$30,000 to high-$40,000 range each month. While a majority of Carbon Express’ drivers run routes that enable them to return home each night, more than a quarter of its drivers do require lodging, Rush said, adding that he pays, on average, $25,000 less per truck for daycabs. Carbon Express is not the only carrier that has moved in this direction. Nationwide Auto Transport Inc. has been providing lodging for drivers for about two years, said Julie Delp, the company’s president. The Lincoln, Neb.-based car hauler’s fleet consists of 75% sleepers and 25% daycabs, but Delp said the carrier is in the process of ordering new trucks and will shift to 80% daycabs and 20% sleepers. The company offers lodging to all drivers who operate daycabs and every third night for drivers with sleeper units. Delp said the move toward paid lodging was based on an analysis of engine idling. She said the carrier had offered drivers incentives for reducing idle time, but realized that the drivers had to idle to be comfortable in the cab. Now the company has seen close to a 40% reduction in idle hours, she said. Nationwide Auto Transport has found that hotel use has led to a decrease in equipment damage. Steve Bramble, director of talent acquisition for Holland, a regional less-than-truckload unit of YRC Worldwide, said the company uses all daycabs and puts drivers up in hotels. The perk of private hotel rooms helps with recruiting, he said. Holland has 6,000 drivers, and close to 2,000 of them are in over-the-road operations. The use of hotels also improves driver retention, Carbon Express’ Rush said. Delp, of Nationwide Auto Transport, also believes hotel lodging aids retention. As a driver, McNamee said he likes not having to wait in line for a ticket for a shower and he appreciates the ability to hit the fitness room after work. McNamee uses the evenings in his hotel room to catch up on paperwork or reach out to students through Trucker Buddy, a program in which truck drivers partner with schools to become pen pals with students and contribute to their education. Fleet executives also said that drivers enjoy the privacy that comes with a hotel room versus shared public facilities. Delp said hotels give drivers a nice separation between personal time and work time, which they don’t get in a sleeper. “The drivers are clean, they’re rested, they feel normal and they’ve been able to de-stress. They can take a walk or go to a restaurant,” she said. A hotel also makes it easier for drivers to take care of basic needs during the night, such as using the restroom. For drivers in sleepers, visiting the nearest restroom could mean they have to fire up the truck and drive to the nearest facilities, Delp said. “Now they have to explain why they used personal conveyance,” she said. Drivers also appreciate the free meals or breakfast to go offered by some hotels. “Schedule permitting, you can usually get a pretty healthy breakfast. As a driver we’re saving money,” McNamee said. Delp also hears that drivers enjoy hotel perks. However, fleets that run exclusively daycabs do need to plan their routes differently. Carbon Express has utilized relays on some routes to get drivers home each night. “About six or seven years ago we were offered a piece of business from Louisville to outside of Kitchener, Ontario, which is about 500 miles. We knew no matter how we did it, we needed two trucks and two drivers,” Rush said, explaining that the two drivers meet in the middle of the run. Last summer, Carbon Express even had nine drivers travel all the way from New York to Fairbanks, Alaska, in daycabs. “They all went with a smile and they still have one,” Rush said, adding that the trucks were equipped with single 110-gallon fuel tanks, super singles tires, lift axles, disc brakes, collision avoidance technology, automatic tire inflation systems and cameras. Drivers at Carbon Express book their own hotel rooms. McNamee logs into a lodging app and searches for rooms during his rest breaks. “I can do a 5- to 10-mile search for the hotels that take our corporate lodging card, and then I open up the details for each one in the area and most of them have truck parking listed,” he said. After selecting a hotel, he calls to book the room and then uses a Google Earth search to look at the location in advance. “Just because they say they have truck parking doesn’t mean it will be easy to get in and out,” McNamee said. Western states sometimes require additional planning because towns are farther apart. “Sometimes we have to stop earlier than we planned,” McNamee said. Nationwide Auto Transport set a limit of $80 a night for a room, which drivers can enter into their app. They can also search via the ZIP code and specify the need for truck parking, Delp said. Holland has developed long-term partnerships with many of the hotels it uses. “We have relationships with those companies and they treat our folks well. We’ll call the hotel and tell them we’re sending someone over,” Bramble said, adding that if drivers do experience any issues they can reach out to central dispatch or employees at the terminals.